The more time I spend with the stylish, the clever and the crafty, the less satisfied I am with my store-bought options. Etsy is always a good fallback, but nothing can compare with doing a thing with my own hands. Of course nothing else can compare with the frustration and waste when that process doesn’t work out quite right. Or at all. I’m pretty needy when it comes to DIY. I don’t have much free time. I know, who does? But really, I don’t. Two very small kids and a wonderful but consuming job means I can go days without a moment to myself. Also, about those small kids. I don’t want a bunch of choking hazards scattered around my house. And I also don’t want a bunch of really delicate stuff hanging around, waiting to be smashed. So I’m on the lookout for the dodo birds of craft projects: Easy, fast, clever, inexpensive, kid-friendly. Believe it or not, I’ve found a few small possibilities for Valentine’s Day. Most of which I won’t write about now, since Damon sometimes drops by. (Don’t get your hopes up honey, we’re talking small potatoes!). The only way I could screw it up (I think) is to fail to order the photos on time. And those are already on their way to me. It feels so good to occassionally be running on time. If you want to do this, you’ll need 52 verticals. I counted twice. 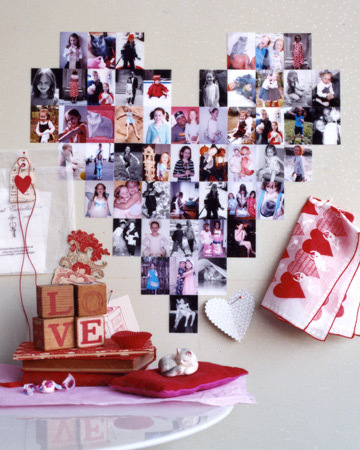 There’s a neat service called Shape Collage that will make a much more interesting heart (or virtually anything else) for you, but I want my mom to be able to take those pictures down and stick them right in frames. I can’t teach you a craft! You totally could teach me a craft. What do you want to learn? I’m going to take a woodturning class. First I’d like to learn what woodturning is. I’m going to turn a block of wood into a bowl. I don’t know how I’m going to do it and I hope I don’t lose a finger (or several).